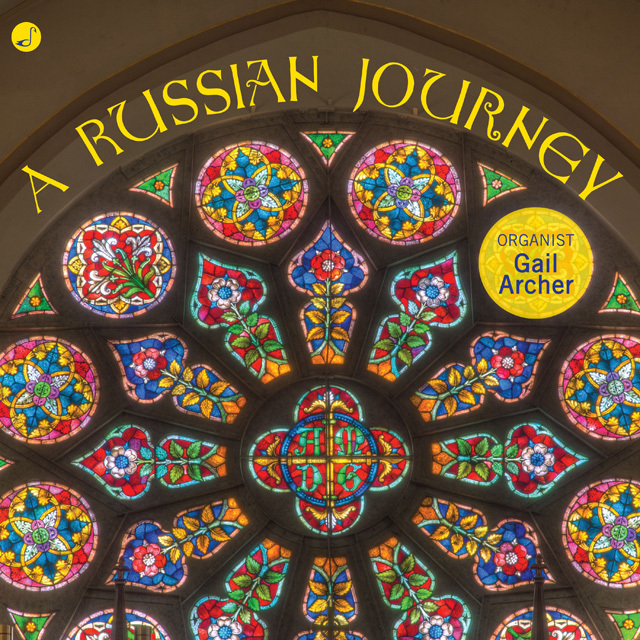 Travelling through Russia in 2013 Gail Archer found – just like Van Cliburn also did in 1958 and on various subsequent travels in the then-Soviet Union – that Russians have an abiding passion for music – especially their music, which is not only deeply Romantic, but also almost entirely different from the music of the rest of Europe. This disc, A Russian Journey is a result of that sojourn through that country. Judging by the repertoire contained here seems to set no limits to her explorations, this dazzling recital discerningly assembled and held aloft by the musical pillars of composers who came to be known as the Russian Five, this deeply felt music can hardly expected to be the last we’ll hear of A Russian Journey. If one’s reflexive default at the prospect of an organ recording – even an exquisitely curated Russian music one – is one of dispassionate resistance, this recording is as likely to turn ears as any made. Along the way, in a deftly balanced presentation of strikingly contrasting essays, Miss Archer offers beautifully turned, reflective and buoyant readings of sui generis concert works. Two Cesar Cui’s “Preludes”, with its exquisite musette-like opening in the “G-minor” and the subsequent “A-flat major” which trips along in a manner in which organists seem universally reluctant to pursue, are simply pearls. The endless vistas of Sergei Ljapunov’s “Prelude Pastorale Op. 54”, with its reflective qualities is heard here to memorable effect, reawakened in the stunningly voiced combinations of sounds from the pipes of the organ. An unusual, organ rarity comes in the form of Alexander Glazunov’s is “Prelude and Fugue in D-minor Op. 98”. Here Miss Archer alights on all kinds of malleable Glazunov delights habitually found in a composer who favoured more symphonic works shows off its massive harmonics at the end. The works were recorded on the 53-rank Schlicker organ at St. Joseph’s Church in Georgia. Great instrument aside, the provenance and fragrance of Alexander Schaversaschvili’s “Prelude” and “Fugue” are truly atmospheric. This is largely down to the judicious alchemy of Gail Archer’s perception of how architecture and local colour can collide to mesmerising effect. Nowhere is this more in evidence than in Modest Mussorgsky’s “Night on Bald Mountain” with its glistening parallel motion over the pedal deep into the piece, (in other organists hands often a bloated gesture) but in Miss Archer’s, enticingly held back to set up the rich-textured gravitas that follows. Inexorable momentum here is born of fervent authority, a virtuosity of combined effects without gratuitous excess.